Colour blending can be used to simultaneously display values from multiple volumes in an intuitive way. The colour blending group co-renders three volumes using blending rules. Each volume is assigned to a colour channel. The final display is a mix of the contributions from each of the channels. RGB blending provides three colour channels: Red, Green and Blue. The combination process is additive: low values in a channel result in dark colours while high amplitudes result in bright colours. A strong response in all three channels will output as white. 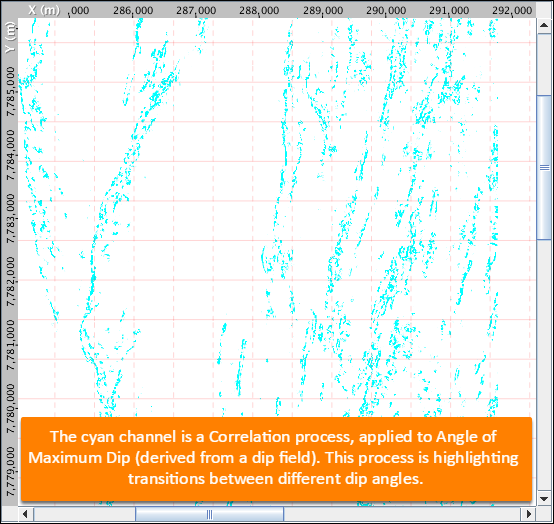 CMY blending provides three colour channels: Cyan, Magenta and Yellow. The combination process is subtractive: low values in all three channels output as white, with strong responses outputting darker colours. RGB blending can be used to simultaneously display different frequency bands from a spectral decomposition analysis to help identify frequency dependent structures (such as variations in thickness of channel features). To find out more about our spectral decomposition process, see Spectral Decomposition. 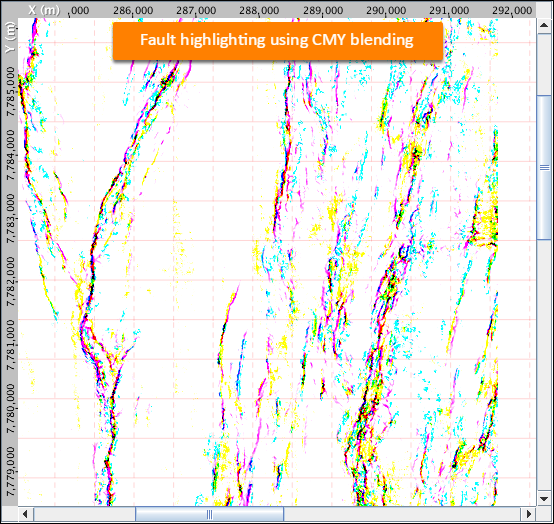 CMY blending can be used to show multiple structural attributes, each using a different technique to identify faults. The different colours provide an easy way to identify areas where the attributes agree, or where one attribute discriminates different features as compared to another. In the Control Panel, open the Group tab. Click New RGB/CMY Group and type a name for the group. In the Details Panel, choose between RGB or CMY blending. 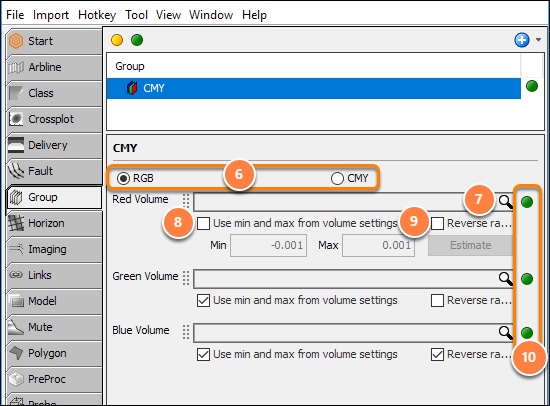 Select the appropriate volumes for Red, Green, Blue or Cyan, Magenta, Yellow. Alternatively, right click on a volume in the Volume tab and select Add to Group. Tip: If spectral decomposition (or gather volumes) are chosen, an additional selector to specify the frequency (or gather dimension) will appear. Select the check box to Use min and max from volume settings. If unchecked, specify a separate min and max clip for the volume, or click Estimate for Insight to estimate a reasonable range. By altering the min and max clip of a volume, you will be able to view certain events in the traces clearer. Select the Reverse ra... check box to reverses the values from an individual channel. Click the green traffic light button to enable/disable the selected volume. Note: The selected Red, Green and Blue volumes can be inter-changed by dragging the left side of the label up or down to the desired colour. RBG blending of spectral decomposition can be used to highlight different thicknesses in channel structures. 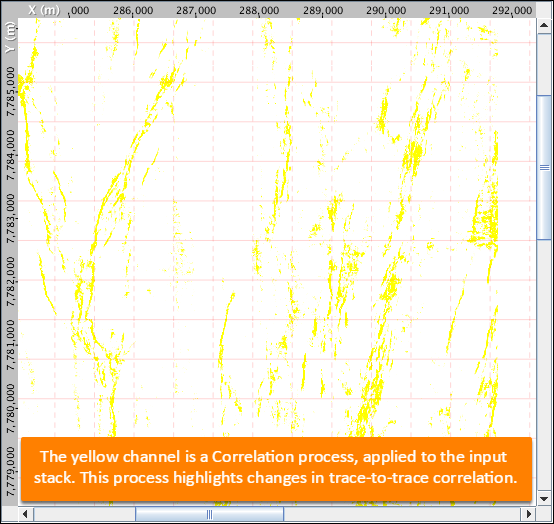 Example: Use spectral decomposition to identify potential channel features. Use RGB blending of the frequency data below a flattened horizon to identify changes in frequency response, consistent with different channel thicknesses. 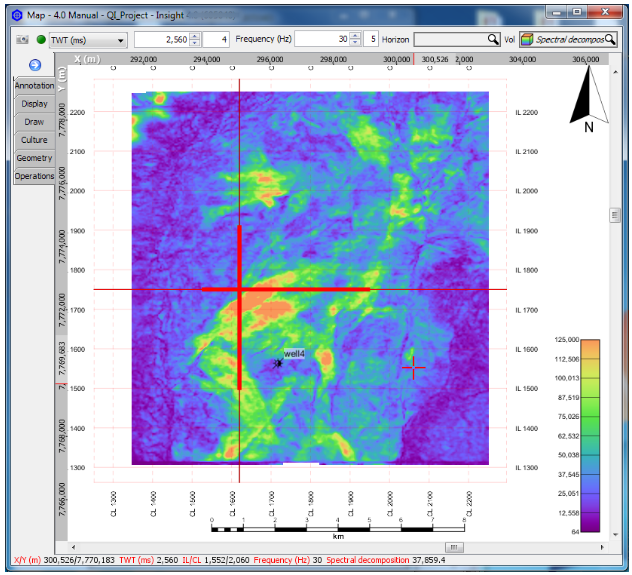 Viewing RGB blends of balanced Near-Mid-Far stack data when flattened to a depositional surface can reveal AVA and possible fluid effects. Possible bright amplitude features are identified in spectral decomposition volume, brighter in the higher frequencies. Notice that it was just missed by well 4. Create an RGB blended volume from the above spectral decomposition blending low, mid, and high frequencies. Still not clear enough. Let’s put some geological context in here. The base reservoir horizon has been picked as a depositional surface just below the channel features. 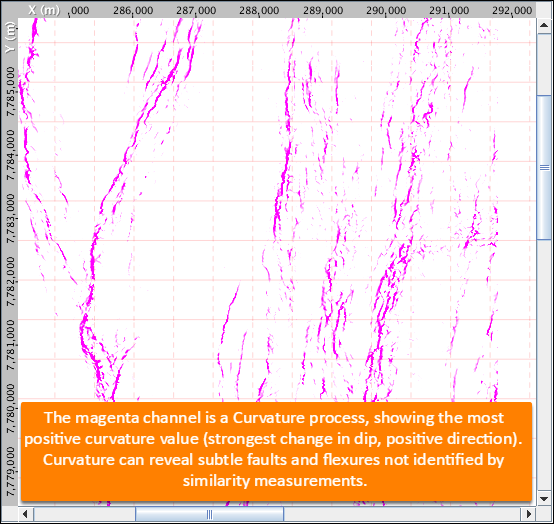 Create a flattener process, flattening the data to our horizon. Displayed time slice of spectral decomposition volume in the flattened domain. Scroll through time-slices above the flattened horizon. The bright amplitude seen in the full stack may be our channel. 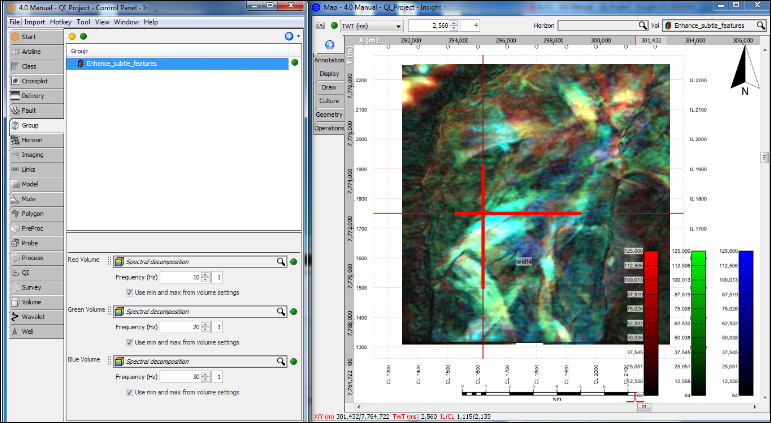 Looks promising in the flattened, RGB blended spectral decomposition volume. Let’s use RGB blending to combine our Near, Mid and Far Stacks in the location identified in step 3. RGB blend of Near, Mid and Far stacks. Nice example of a possible channel feature missed by well 4. Perhaps continue on with an AVO study on this area. Insight has some great gather imaging processes that can be utilized to remove unwanted noise in the original gather volume before continuing with AVO. In this example, CMY blending is used to combine the display of different processes used to highlight structural features. 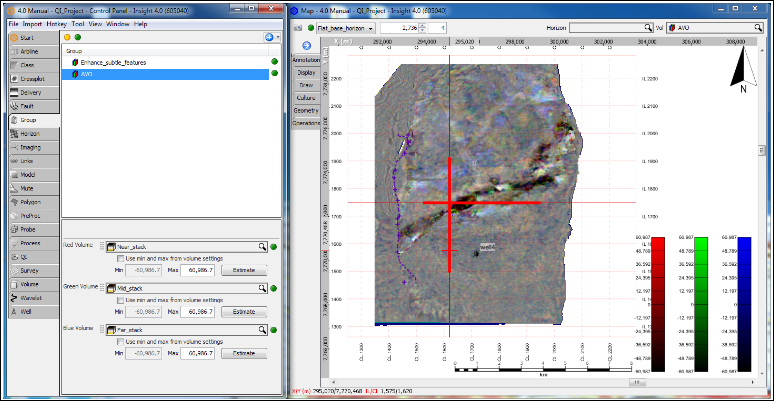 The single blended view allows easier interpretation of the fault structure.